Crowe, Keith. "Comprehensive Land Claims: Modern Treaties". The Canadian Encyclopedia, 03 April 2019, Historica Canada. https://www.thecanadianencyclopedia.ca/en/article/comprehensive-land-claims-modern-treaties. Accessed 19 April 2019. Comprehensive land claims are modern-day treaties made between Indigenous peoples and the federal government. They are based on the traditional use and occupancy of land by Indigenous peoples who did not sign treaties, and were not displaced from their lands by war or other means. These claims, which are settled by negotiation, follow a process established by the federal government to enable First Nations, Inuit and Métis to obtain full recognition as the original inhabitants of what is now Canada. Settlement of these claims comprises a variety of terms including money, land, forms of local government, rights to wildlife, rights protecting language and culture, and joint management of lands and resources. Treaties are constitutionally protected, mutually binding agreements. Those signed by Indigenous peoples between 1701 and 1923 are commonly referred to as historic treaties, and modern treaties refer to those agreements negotiated since then. The goal for land claim negotiations as part of the treaty process is to provide jurisdiction and resolve ambiguity over the ownership and use of land and resources. A treaty will codify the rights and obligations of the parties. At the core of the process are negotiations between Indigenous groups and the federal government, and in some cases the provincial and territorial governments, as well as other third parties. The process, which aims to make economic and social adjustments between two different societies, is formally based on legal concepts such as land title, Indigenous rights and treaties. Modern treaties, or comprehensive land claim settlements, include provisions that enable Indigenous groups to own land, participate in managing land and resources, share in revenue generated from resource development and govern themselves. (See also Indigenous Territory; Self-Government: Indigenous Peoples). The Royal Proclamation of 1763 reserved an unspecified area of what is now Canada for the use of Indigenous peoples, and forbade any unauthorized purchase or possession of those lands by settlers. The British government, and Canadian governments after Confederation in 1867, concluded treaties with various groups of Indigenous peoples to legitimate European settlement in their lands. The historic Treaties 1 to 11 signed between 1871 and 1922 — often called the Numbered Treaties — mostly encompassed the Prairie Provinces (see Alberta; Saskatchewan; Manitoba) and Ontario. The settlement of non-Indigenous people in most of British Columbia, as well as the Yukon, the Northwest Territories, Nunavut, Québec and Eastern Canada (see Nova Scotia; New Brunswick; Newfoundland and Labrador; Prince Edward Island), therefore proceeded without confronting the issue of Indigenous title to lands. Even in the case of the Numbered Treaties, many descendants of the Indigenous signatories claim that their title to the land was never ceded; rather, the intent was to share the land and its resources with the federal government. Although Indigenous peoples have, from the beginning, struggled to maintain their identity and to assert their rights to their traditional territories, the movement for Indigenous rights and claims that began for a few bands in the 19th century did not become prominent until the 1960s. Many factors contributed to the expression of these aspirations. Minority rights of all kinds and concern for the environment became worldwide causes. The search for minerals and new sources of oil, gas and hydroelectricity brought the Indigenous peoples of the North into the mainstream of Canadian life. Destructive policies such as those related to residential schools threatened Indigenous languages and cultures. These policies engendered severe generational trauma; however, they also galvanized many young Indigenous people to enter and challenge the Euro-Canadian political and legal system (see Indigenous People: Political Organization and Activism). Canada has also been influenced by the treatment of claims and Indigenous rights in other countries. In 1946, the United States government created an Indian Claims Commission and in 1971 legislated the Alaska Native Claims Settlement. Australia passed an Aboriginal Land Rights Act in 1976; and in 1978 Denmark granted home rule to Greenland. Proposals to establish a body similar to the US Indian Claims Commission in Canada resulted in the drafting of two bills, in 1963 and 1965, which proved unsatisfactory and were never enacted. In 1969, the federal government appointed Lloyd Barber as commissioner of Aboriginal claims to determine and recommend appropriate means of resolving claims. Early in the 1970s, the government set up a system of research funding for Indigenous political and cultural associations to enable them to document and organize their land claims. It was also during this time that Indigenous peoples across Canada began asserting their title to traditional lands. In 1972, the Indigenous peoples of Old Crow in the Yukon Territory presented a petition to Parliament concerning oil and gas exploration on their hunting grounds (see Gwich’in). In the Calder Case in 1973, the Supreme Court of Canada split three to three in recognizing the land title of the Nisga’a of British Columbia, and in the same year the Yukon Indian Brotherhood presented a formal claim to the federal government. In 1973, Justice William Morrow of the Northwest Territories recognized the Aboriginal title of the Dene of the Mackenzie River Valley. The same year, Justice Albert Malouf recognized the title of the James Bay Creeand Inuit of northern Québec. These decisions were later appealed and overturned, but they gave important weight to the cause. On 8 August 1973, the federal government, responding to the claims of the Nisga’a and the James Bay Cree and Inuit, and also wishing to clear the way for industrial development of the North, announced a new policy for the settlement of land claims. The policy confirmed the responsibility of the government to meet its lawful obligations through fulfillment of the terms of the treaties and to negotiate settlements with Indigenous groups in those areas of Canada where Indigenous rights based on traditional use and occupancy of the land had not been dealt with by treaty or superseded by law. The policy emphasized that the co-operation of provincial and territorial governments would be required. In order to carry out the new policy, an Office of Native Claims was created in 1974 within what is now Indigenous and Northern Affairs Canada (INAC). Under the leadership of an assistant deputy minister, negotiators, lawyers and researchers dealt with two main types of claim: specific and comprehensive. Specific claims are based on problems arising from the administration of treaties, the Indian Act, First Nations funds and disposition of land. Although negotiation is the preferred course of action by both parties to settle these claims, settlement may also be reached by administrative remedy or court action. Specific claims are usually made by Indigenous groups living in the provinces, as opposed to the territories, and most settlements consist of compensation and land (sometimes land only). Comprehensive claims are based on the traditional use and occupancy of land by Indigenous peoples who did not sign treaties, and were not displaced from their lands by war or other means. These claims, which are settled by negotiation, involve the two territories and the northern parts of some provinces. The areas of land and the number of peoples involved are usually greater than in the case of specific claims. Settlement of these claims comprises a variety of terms including money, land, forms of local government, rights to wildlife, rights protecting language and culture, and joint management of lands and resources. The federal government provides funding in the form of contributions to Indigenous associations for the research and presentation of their claims. Once claims are submitted, lawyers of the Department of Justice and officials of INAC determine the acceptability of each claim. Upon acceptance, further funding is provided to the associations for research and for negotiation. These disbursements must be repaid from the proceeds of the eventual settlements. In 1980, the federal government appointed the first chief negotiator from outside the public service to assure greater neutrality and access to ministers. In 1982, the Canadian Constitution was amended to confirm Indigenous rights, including those identified in claims settlements. The Office of Native Claims was abolished in 1986 and replaced by several specialized units of the Department — including one to oversee the implementation of agreements. New federal policy papers were published in 1987, 1991 and 1996, and provincial and territorial governments alike created their own administrative structures for claims and Indigenous affairs. Formulas were found to deal with the impasse over “extinguishment” (cession) of Indigenous rights, with regards to the government’s need for agreements to be final. During more than four decades of negotiation of Indigenous land claims in Canada, the system has responded to national and international changes in communications, economics, value systems and politics. The implementation of settled claims agreements has provided a basis for improvement and revision, and for a number of confrontations. The most significant of the land-claim confrontations was the Oka crisis of summer 1990 when a long-standing dispute over land ownership, tensions within the Kanesatake Mohawk community and with the local population of Oka combined in an eruption that included blockades, the shooting death of a provincial police officer, a standoff between Mohawk warriors and Canadian soldiers, and violence and destruction by civilians on both sides. The affair attracted international attention. On 31 May 1991, the Commons Standing Committee on Aboriginal Affairs produced a report on the events, with recommendations that were subsequently incorporated into federal claims policy. Major issues affecting the Mohawk of Kanesatake and Kahnawake, however, are ongoing. Another land-claim dispute occurred in November 1994, when, after years of tension, the First Nations of Penticton, and Upper and Lower Similkameen, British Columbia, erected a barrier across a road leading to the Apex Ski Resort in order to halt expansion of commercial activity on lands claimed as traditional territory. This action touched off a series of failed negotiations, legal suits and applications for injunction between the First Nations, the provincial government and the resort company. The Supreme Court of BC granted an injunction guaranteeing public access to the resort, but the overall issues of access and land ownership have yet to be resolved. In the Gustafsen Lake region of BC a year later, during the summer of 1995, a dispute arose between a rancher and a small group of Indigenous peoples (Secwepemc and others) and their sympathizers over the use and occupancy of ranch land for a Sun Dance ceremony. When the protesters threatened to use firearms, Royal Canadian Mounted Police were called in by the province. After a standoff of several weeks, with shots fired by both sides but no casualties, the demonstrators negotiated an end to the conflict. In Ontario, the Kettle Point and Stony Point Chippewas of Ontario sought for years to retrieve lands that were taken by the federal government to establish the military base of Camp Ipperwash (see Ipperwash Crisis). In 1995, a demonstration by First Nation members over burial grounds resulted in police action and the shooting death of a demonstrator, Dudley George. On 16 January 1996, the minister of INAC announced its appointment of a federal negotiator and its intention to settle all issues surrounding the conflict and make amends for wrongfully taking Stony Point lands. In September 2015, the Chippewas of Kettle and Stony Point First Nation accepted a $95 million settlement from the federal government that included the return of the land as well as about $20 million in compensation to band members and $70 million for future development of the land. Although not all Stony Point members supported the deal (protestor Perry George was accidently burned during a protest on 20 September 2015), the final agreement was signed on 14 April 2016 by Chief Thomas Bressette and representatives of the federal government. As in other parts of the country, Indigenous nations in Northern Canada have also made claims to traditional lands. In some cases, these claims made self-government a reality. The James Bay and Northern Québec Agreement (JBNQA) of 1975 was negotiated and settled largely in response to the threat of hydroelectrical development. It was signed by the Cree and Inuit after only two years of negotiation — far less than any subsequent process. The Naskapis of Northeastern Québec (see Innu) joined the negotiations during the later stages and signed a companion agreement in 1978. The 1975 JBNQA had provided $168.8 million for the Cree and $91 million for the Inuit, as well as land, an environmental and social protection system, and an income security program for hunters and trappers. The Cree-Naskapi (of Québec) Act (1984) and the Act respecting Northern Villages and Kativik Regional Government (Government of Québec)(1978) established a form of self-government for the Cree and the Inuit. By 2014, there were 24 complementary agreements amending the JBNQA. In the Northwest Territories (NT), the Inuvialuit of the Mackenzie Delta broke away from their original alliance with other Inuit of the territory and signed a new treaty in 1984. It was an agreement between the federal government and the 2,500 Inuvialuit people of the territory’s oil- and gas-rich Beaufort Sea area. The settlement reserves to the Inuvialuit approximately 95,000 of the more than 430,000 km2 they traditionally used. Moreover, it is made explicit that the Inuvialuit are to receive royalties on any oil or gas extraction that takes place on their land. The agreement foresaw the participation of the Inuvialuit in a limited form of local self-government through the creation of the Western Arctic Regional Municipality. Nine years later, the Inuit of central and eastern NT concluded their Nunavut Land Claims Agreement in 1993, and the Nunavut Act providing for the new Territory of Nunavut was negotiated concurrently with the land claim. The Nunavut agreement marks a major watershed in dividing the Northwest Territories into two distinct jurisdictions. The easternmost of the jurisdictions is known as Nunavut, where Inuit language and culture are being entrenched on the basis of a public government that covers the approximately 2 million km2 traditionally used by the more than 17,000 participants in the treaty. These Inuit and their descendants will retain title to about 350,000 km2. About one-tenth of this amount includes subsurface mineral rights. By the year 2007, the Inuit were paid 14 instalments totalling $1,173,000,000. They are also paid a percentage of the royalties the federal government collects for resource exploitation on Nunavut lands. In the Yukon Territory, the Council for Yukon Indians (now the Council of Yukon First Nations) representing 11 First Nations ended 20 years of negotiation with the Umbrella Final Agreement in 1993. Later that year, the Vuntut Gwitchin, the Nacho Nyak Dun, the Champagne-and-Aisihik and the Teslin Tlingit Council each concluded final and self-government agreements. In 1997, final and self-government agreements were signed with the Little Salmon/Carmacks and Selkirk First Nations. The self-government agreements negotiated between 1995 and 2005 by northern First Nations granted wide jurisdiction, including province-like powers in regard to justice, law and order, education, health services and cultural practices. Modern treaties can also be built upon existing treaties, such as Treaty 8 and Treaty 11, by negotiating land claims and self-government agreements rather than changing or displacing the original treaties. Several groups of NT First Nations and Métis are negotiating settlements based on Indigenous and treaty rights rather than using the comprehensive claim process. The federal government negotiates with the Métis in NT differently than in the rest of Canada. Many NT communities have blended populations of First Nations and Métis people. Therefore, their interests are negotiated collectively. Negotiations with the Dene and Métis began in 1981. Before 1990, the negotiation of a new treaty in this area was carried forward through a collaboration linking different Dene groups with the Métis of the region. Negotiators for the Dene and Métis concluded an agreement in principle, but after 1990 this common front broke down due to a disagreement over the principle of whether or not modern-day treaties were acceptable with language that seemed to extinguish rather than confirm Indigenous rights. The general assembly of Dene and Métis broke into several groups, each of which has pursued its own settlement with government. The Gwich’in land claim was settled in 1992, followed by the Sahtu Dene and Métis Comprehensive Land Claim in 1994; and the land claim and self-government Tlicho Agreement with the four Tlicho Treaty 11 communities in the North Slave region was settled in 2003. Perceiving themselves as pragmatists rather than purists, members of the Gwich’in Tribal Council agreed in 1992 to “cede, release and surrender to Her Majesty in the Right of Canada all their Aboriginal claims, rights, titles and interests” to “lands and waters anywhere within Canada.” The agreement also includes a clause “to indemnify and forever save harmless” the Canadian government from all future Gwich’in actions, suits and claims of Crown liability. In return for sanctioning this sweeping language, the Gwich’in are to receive approximately $73 million. Moreover, their communities receive “Gwich’in title” to about 22,000 km2, about one-quarter of which includes subsurface mineral rights. The Sahtu Dene along with their Métis relatives in the Great Bear Lake region settled for similar terms two years later. Their 1994 treaty, like that of that of the Gwich’in and those of the Yukon First Nations, includes provision for significant Indigenous representation on various boards and tribunals set up to deal with matters as diverse as wildlife management, heritage, training, labour, parks and environmental planning. The Akaitcho Dene of the South Slave region entered into a treaty land entitlement process rather than a comprehensive claim; however, because the Métis were not included in the original treaty, they could not participate in the Akaitcho Dene process. In 1996, the South Slave Métis Tribal Council (now the Northwest Territory Métis Nation) signed a framework agreement to negotiate land and resources. The Dehcho First Nations Tribal Council represents 10 NT First Nations and three Métis Locals. In 1999, the Dehcho Process began negotiations on a framework agreement followed by an Interim Measures Agreement, both of which were signed in 2001. The Dehcho Interim Resource Development Agreement, signed in April 2003, provides a share of federal royalties from resource development in the Mackenzie Valley. These framework agreements are built upon existing treaties to conserve and promote the cultural and economic well-being of the Aboriginal members and communities in the Dehcho territory. The Tlicho and the NT government signed the first agreement in the territory to combine a land claim and self-government agreement in 2003. The Tlicho Agreement, which came into effect in 2005, established a distinction between Aboriginal land rights and non-land rights. In Alberta,the Sioux Valley Dakota Nation and the Canadian government negotiated an agreement in 2014, making the Sioux Valley Dakota Nation the first self-governing First Nation in the Prairies, with law-making powers in more than 50 areas. In the heart of Alberta’s oil sands region, the Lubicon Lake Cree Band live within the territory covered by Treaty 8 that was signed in 1899, but the band did not sign the treaty at that time. In the 1980s, a federal negotiator was appointed to discuss the Lubicon Lake Cree’s long-standing claim and grievances with Alberta provincial representatives; however, the Lubicon Cree still do not have a modern-day treaty. In the territories, the federal government and Indigenous peoples negotiate claims; however, in the provinces, three rather than two governments must agree in order to reach resolution: the First Nation, the federal government and the province. In British Columbia, the federal and provincial governments and First Nations representatives established the BC Treaty Commission in 1993. 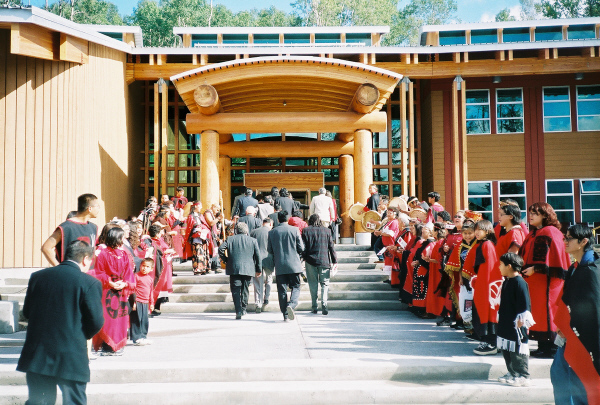 Negotiations within the BC Treaty Commission Process resulted in the provincial ratification of a treaty with the Nisga’a Tribal Council in 1999. Upon Parliament’s passage of the Nisga’a Final Agreement Act in 2000, the treaty became the first modern-day treaty in BC and the 14th modern treaty in Canada to be negotiated between 1976 and 2000. The Nisga’a treaty gave the First Nation the right to self-government within the 2,019 km2 in the Nass Valley to which the Nisga’a hold fee-simple title. This includes the authority to manage their lands, assets and resources, and the ability to make laws in regard to Nisga’a citizenship, language and culture. Other BC Indigenous groups continue negotiations of their claims. The Tsawwassen First Nation and the Maa-nulth First Nations finalized agreements in 2009 and 2011, respectively. As of February 2015, there were approximately 60 ongoing comprehensive claims negotiations in British Columbia, representing two-thirds of the Indigenous peoples in the province. Altogether, overlapping claims cover more than 100 per cent of British Columbia. BC treaty negotiations are arguably the most complex set of negotiations Canada has ever undertaken, and the most complex treaty negotiations ever undertaken in the world. In 1983, the Algonquins of Golden Lake (now known as the Algonquins of Pikwàkanagàn) submitted a comprehensive claim to the federal government, then in 1985 to the Ontario provincial government, and claim negotiations began in 1991. 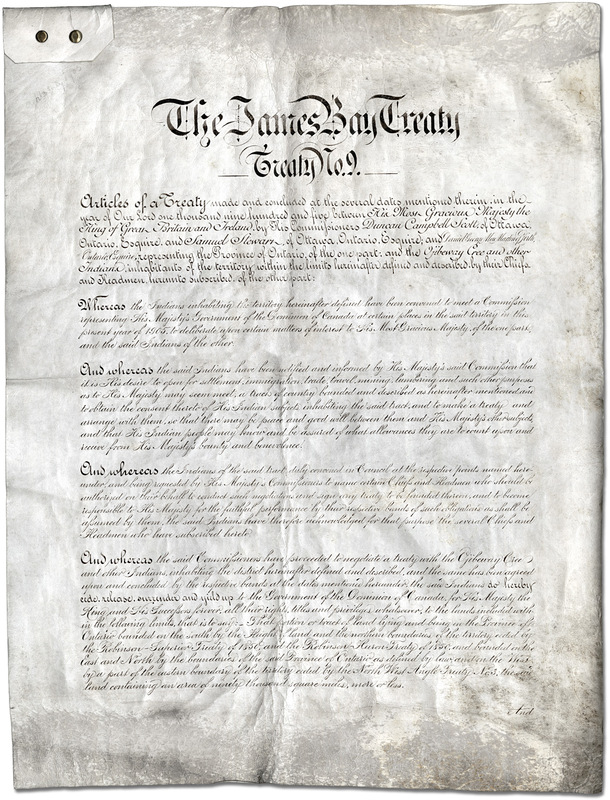 The claim was associated with a series of petitions presented to the Crown since 1772, and contends neither rights nor almost nine million acres of land were ever sold or ceded through treaty. In 1994, the three parties agreed to a common Statement of Shared Objectives. The agreement was reaffirmed in 2006, and a renewed framework for negotiations agreement was signed in 2009 by the three parties. In October 2016, the Algonquins of Ontario signed a land claim agreement-in-principle (i.e., a step towards a final contract) with the Canadian and Ontario governments that covers 36,000 km2 of land in eastern Ontario. As part of the deal, 117,500 acres (475.505 km2) of Crown land will be transferred to the Algonquins of Ontario. In addition, the Algonquin will be awarded $300 million total from both levels of government, as well as rights to the land and natural resources. Algonquin peoples in Québec and other Indigenous nations, such as the Haudenosaunee, have criticized the agreement-in-principle, arguing that the land claim overlaps their territory. There is also a dispute over who qualifies as Algonquin under the agreement. While the final details of what will be Ontario’s first modern treaty may take years to ratify, it remains an historic agreement — one that has taken 24 years to negotiate. The Atikamekw and Innu of Québec and Labrador, and the Inuit of Québec (Makivik Corporation) are also negotiating claims to the offshore in Québec and Labrador. The Labrador Inuit Land Claims Agreement (LILCA) was finalized in 2005; it is a modern-day treaty between the Inuit of Labrador, the province of Newfoundland and Labrador, and Canada. LILCA established the Government of Nunatsiavut, and included provisions for self-government, special rights to 72,520 km2 of land and 48,690 km2of ocean, ownership of 15,800 km2 and royalty payments for resource extraction. Land claim negotiations with the Innu Nation of Labrador are ongoing, and a framework agreement was signed by the three parties (Newfoundland and Labrador, Canada and the Innu Nation) in 1996. The Tshash Petapen (or “New Dawn”) Agreement, signed in November 2011, paves the way for a final agreement involving Innu title to 12,950 km2 of Labrador and special rights to an additional 36,260 km2, as well as royalties from resource development and hydroelectric projects. The Eeyou Marine Region Land Claims Agreement comprises the claims of the Cree of Eeyou Istchee, a region in northwestern Québec and the islands in James and Hudson bays. The oceans and waterways in the region continue to be used in traditional ways by the Cree for hunting sea mammals and waterfowl, and for fishing. Almost all the Eeyou Istchee Indigenous peoples reside in five communities on the coasts of James Bay and southern Hudson Bay, and in four inland communities. In 2003, the Nunavik Inuit and the Cree signed an agreement covering the region from the La Grande River north to Long Island in Hudson Bay and northeast along the Hudson Bay coast that was traditionally Cree territory. The agreement between the Cree and the Inuit integrated both the Nunavik Inuit Land Claims Agreement (NILCA) and the Eeyou Marine Region Land Claims Agreement. The NILCA addressed ownership of Nunavut land and resources in James Bay, Hudson Bay, Hudson Strait and Ungava Bay, as well as part of northern Labrador, which became effective in 2006. NILCA overlaps the agreements between the Nunavik Inuit and each of three other Indigenous groups in the region: the Nunavut Inuit, the Cree of Eeyou Istchee and the Labrador Inuit. In 2009, all parties accepted the final agreement; and in the 2010 vote, almost 71 per cent of all the Cree across northern Québec endorsed the Eeyou Marine Region Land Claims Agreement. As of 2016, there are about 100 comprehensive land claim and self-government negotiation tables around Canada. Comprehensive land claims are being negotiated in Eastern Canada, Québec, British Columbia, the Northwest Territories and the Yukon — areas in which historic treaties were never signed and where Indigenous title was never extinguished. Many groups have negotiated self-government as part of the comprehensive claim process. Of the 26 signed agreements, 18 included provisions for self-government. However, negotiations for self-government can proceed even if a community signed a historic treaty and does not meet the criteria for a comprehensive claim. Therefore, self-government negotiations are proceeding in the Prairie provinces and Ontario in addition to the large areas of Canada not covered by historic treaties. The scope, scale and potential of the Canadian settlement of claims is unique in world history, and though the process is far from complete, there is a promise of a significant positive effect on Canada and perhaps beyond. Comprehensive and specific claims affect most of Canada, and in the case of comprehensive settlements, the combination of land ownership (including some subsurface), compensation funds, specific rights and programs, provisions for joint administration and self-government make the beneficiaries a potentially potent force in the national economy, society and politics. K.J. Crowe, A History of the Original Peoples of Northern Canada (rev. 1993). A New Partnership: Canada and Aboriginal Peoples, Report of A.C. Hamilton to Minister of IAND (1995). Letha MacLachlan, “Comprehensive Aboriginal Claims in the NWT,” Information North XVIII (1992).